Every detail of Leore and Adrian's wedding at the Ritz Carlton-Laguna Niguel was timeless, elegant, and classic! 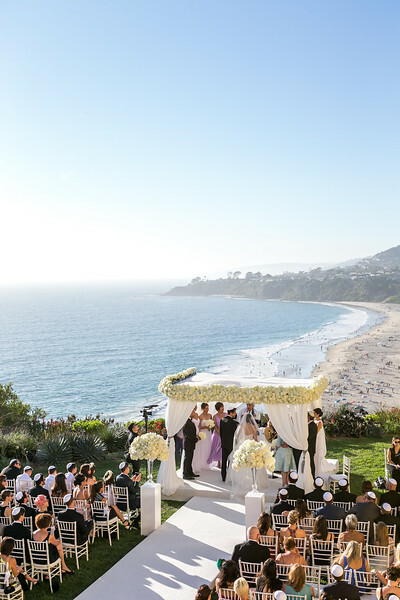 The custom chuppah overlooked the beautiful coast on the Gazebo Lawn at the Ritz Carlton Laguna Niguel. Leore's bouquet was made up entirely of white roses with a white satin ribbon handle. Florals matched Leore's bouquet in a timeless white color and lush design. The aisle and stage were covered in a vibrant white carpet which ran up to the flowing white chiffon-covered chuppah. The fabric was tied back in a symmetrical design with silver tassels. The entrance and end of the aisle were coupled with coordinating white floral designs that sat atop beautiful clear glass vases. The reception carried over the classic white and cream color palette into a very romantic and intimate design. Glamorous mirrored tables ran down the length of the ballroom and led guests eyes to the gorgeous cake and lounge area. 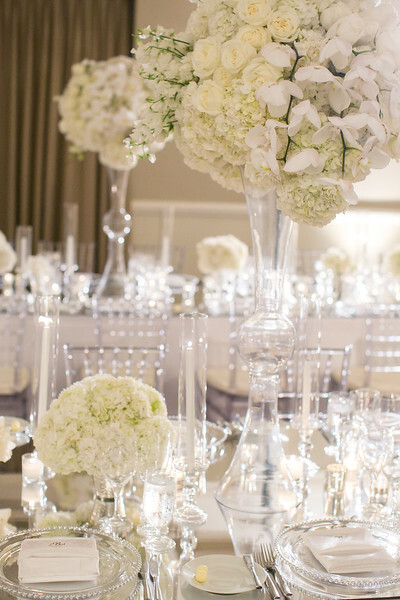 The tabletop design was spectacular- filled with crystal glass, lush white florals, and silver mercury. We used alternating high and low floral designs that were made up of mainly white garden roses, orchids, and spray roses. The beautiful crescent shaped arrangement sat atop our clear glass reflection vases while petite satellite florals were scattered amongst clear glass tapers, small votives, and scattered orchids. We just loved the way that the long mirrored tables brought all of the warmth of the candlelight together! It's always a special occasion when we get to pull out our glamorous crystal candelabras out of storage. They illuminated the room so beautifully!